Many women reckon the importance of adopting regular facial skin care regime to ensure tip top perfection of the faces against time. These impeccable faces are more often than not drawing unfavorable comments when skimpy dresses, short pants, bikini or even elegant bare-back and high-split gowns are cladded on. 1． Blackhead and acne covered back body. 2． Dark and uneven skin tone of the arm pits, inner thighs and lower buttock lines. 3． New and old scars of insect bites and tears. 4． Thick and dull dead skin cells clamouring all over the feets, heels, knees and elbows. 5． Dry, flaky, wrinkled and cracked skin especially on the limbs. It can be quite a setback for women who have spent so much attention and money to their faces and yet the admirations are totally toggled when their bodies are peeked. Eventually many have consciously or subconsciously chosen to wear less revealing outfits to hide the imperfections, flaws and impaired confidence. Introducing the new CRES Body Regenerist Fruitti Spa specially for women who clamour for perfection, top to toe, inside out. It is designed for those courageous women who refuse to hide anymore, who resolve to face it, repair it and change it! It is meant for those sophisticated women who want to flaunt proudly and confidently. 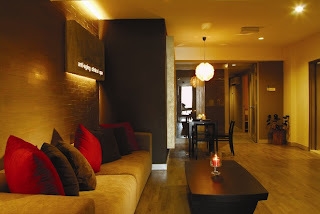 Thanks to CRES, I had a chance to review the CRES Body Regenerist Fruitti Spa at CRES Kepong Branch. The CRES Body Regenerist Fruitti Spa starts with Anti Stress Back Massage using vitamin riched aromatic botanical essential oil, total relaxation of mind and body, stimulate detoxification through lymph nodes, increase blood circulation and de-stress the tensed muscle. It then follow by Frutti Scrub which contains natural marine sea salt, luscious rose petals and pineapple puree. Rich in vitamin B, C and E, exfoliate to remove dead skin cells of the body, expose a layer of young skin cell for a better absoption of vitamins, moisture and essence, leaving skin young, rejuvenated and baby-smooth. Fruitti Yoghurt Masque is applied with the scrub which contains natural fruits extracts from pineapple, lemon, rose and orange. Rich in Vitamin C and fruit enzymes that make skin incredibly elastic and hydrated. The lactic acid in the yoghurt is effective in reducing acne and tightens pores. Enriched with pure essential oil from jojoba for a more moisturized and smooth complexion. The BA put on the Themal Blanket Heat Infusion on me to promote a high infiltration of essence and nutrients into the epidermis layer by stimulating the lymphatic and blood circulation through heat. CRES Body Regenerist Fruitti Spa is ended with Fruitti Bubble Bath. A lavish, long soak in a tub of warm creamy bubble bath rich in vitamin B, C and E to unleash all your tensed musles and stressed mind. Contains fruits moisture, almond and lactic acid, effective in combating skin irritation, eczema and acne problems. Leaving skin ultra smooth, white, young and hydrated. Good news to Wai Yee aka Rane's followers. You can now enjoy 1st Trial CRES Body Regenerist Fruitti Spa @ RM78 and FREE 2pcs of RM 20 Product Voucher (Original price per treatment is RM 300!). All you need to do is to comment at my blog post at CRES facebook wallpage Here. • Open for all Female aged 21 years old and above. What are you waiting for? Get your voucher and book for appointment NOW! Everyone wants to look pretty in the New Year, isn't it? ;) Happy trying!